Bringing the thrill of sports like cricket, hockey, climbing and football, XLR8 brings it all indoors for your convenience. Plus, some fun mini golf for the budding Tiger Woods. How many times have we complained that it’s either to warm or cold or too rainy outside? Too many to keep count of, we suspect. Thanks to XLR8, however, you’ll never need to use changes in weather as an excuse. From football and hockey to netball and cricket, they bring everything under one roof – literally. 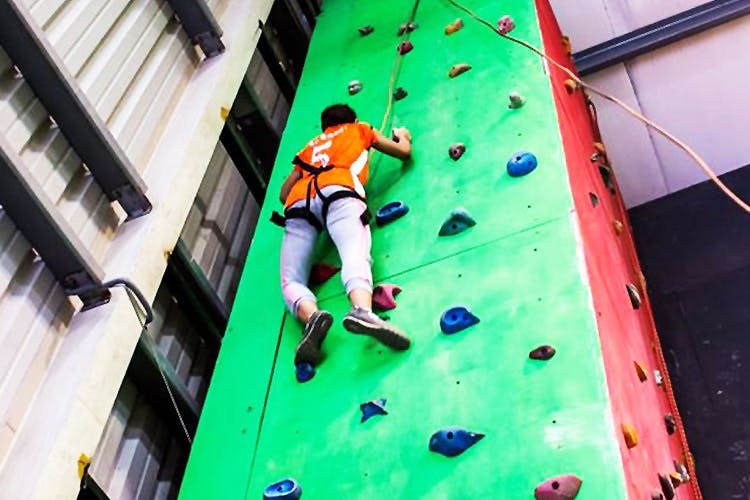 We love that they don’t just give you a covered space, but they really have gone all out in making it a training centre where you can hone your skills and even build a community of fellow sportsmen and women. We particularly like their football pitch — neat and sturdy astro turf where you can really up your game. If you’re serious about playing, then bring out more than 12 people on pitch and you’ll get an official referee too. Plus, equipment like goals, nets and score boards to boot. Come on folks, channel the inner Messi or Ronaldo and get ready for kick off. Oh, there’s also cricket and hockey too which is top-notch but we’re gunning for the mini golf. The only outdoor zone at XLR8, you can swing to your heart’s content. And no we don’t mean dancing, we’re talking about perfecting your golf swing, silly! The first in the city, the astro surface makes sure you can go play anytime of the year… even in light rain! Since it’s a flood-lit, you can even go there when the sun’s down and have yourself a round of nine-holes. Of course, don’t expect fancy clubs or balls – it’s just mostly playful, but be sure it’ll actually set you on the path to becoming a professional. Hit up these small eateries which are around after your game.